The Cayman 38 WA is a well-balanced and well-built product of the Italian shipyard industry. She is an open yacht that can be used as a fast cruiser or as a fishing boat. 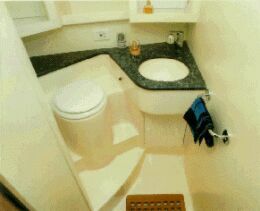 She has a beautiful and modern outside line and very comfortable interiors. We are sure that the Cayman 38 Walk Around competes with other famous yachts of the international arena, above all of the American market, and still she distinguishes herself. Many characteristics make her extremely competitive, such as her extremely modern outside lines representing the futuristic concept of open yachts. 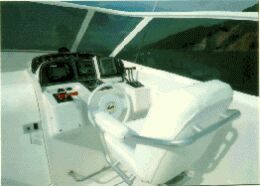 The cockpit has two functions: the forward area is designed for comfortable cruising and the aft area serves as fishing platform with relative equipment. The side decks are nice and comfortable. 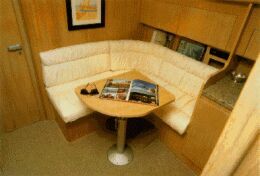 The forward area is fitted with a small yet very useful settee. 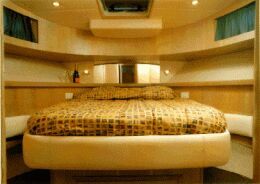 Interior comfort is outstanding with two double staterooms, two bathrooms, a small salon, the dinette and the galley. The Cayman 38 WA is fitted with some technological solutions such as the hydraulic opening door of the engine room, the comfortable locker and recessed swimming ladder on the aft platform and the two storing areas in the sides of the cockpit. In addition, she has excellent performing capabilities that exceed the official values and distinguished stability and maneuverability with an average low power and low fuel consumption. The Cayman 38 above-mentioned superb characteristics as well as her excellent quality/price ratio make her an interesting product on the yachting market. Notes: the tested boat is a prototype. 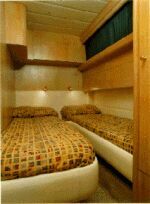 The definite version includes a 2-foot larger guest stateroom aft. Superstructure and windows materials: stainless steel and tempered glass. Chart table: to port of the helm station dashboard or in the cockpit dinette. 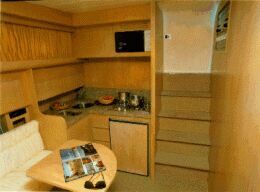 Galley: to starboard of the small salon, with granite worktop, 31.7-gallon refrigerator, 2 sinks, four-burner range, microwave oven, storeroom, cabinets and drawers. Optional fittings: air conditioning plant, Lit. 20,000,000; generating set, Lit. 12,000,000. 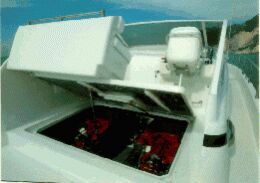 Seakeeping ability, turning and behavior on waves: the Cayman 38 is a very stable and powerful boat. During sea trials, the performing capabilities recorded by the Garmin GPS were greater than those declared by the yard. The boat is very powerful when leaving the plane and very stable even at high speeds. Electrical switchboard and plants: to port of the companionway, of good quality. wood finishing on the outside would have improved overall outside look of the yacht.